Wouldn't it be nice to wash your hair with a natural homemade shampoo bar and avoid those overpriced, sulphate filled concoctions we normally purchase? You can! And no, I'm not talking the 'no poo' method. While that may work for some, it does not work for everyone. I have naturally curly hair. Not the kind that has nice even curls. Mine is frizzy here, straight there and oh...look at that one nice curl at the back! And thirsty? My hair is always thirsty. Washing my hair everyday is an absolute no, no that would leave me with dry, crunchy locks. Using this homemade shampoo bar leaves my hair clean and soft without an oily build up or frizzy fly away ends. I still use a conditioner on my hair due to the 'thirsty' factor mentioned above and recommend using a vinegar rinse once or twice weekly to avoid any build up that may occur especially if you have hard water. As an added bonus, this bar works very well as a body soap, is palm free and has a silky lather that feels wonderful. Silk Peptide - 1.5 tsp. Lye - 123.21 gr. | 4.35 oz. Kaolin Clay (Cosmetic White) - 1 Tbsp. Sweet Orange E/O - 2 Tbsp. Bergamot E/O - 1.5 tsp. Ylang Ylang E/O - 1 tsp. Geranium E/O - 1 tsp. Black Pepper E/O - 1/2 tsp. Patchouli E/O - 1/2 tsp. Ginger Root E/O - 1/2 tsp. I made this shampoo recipe using the Room Temperature method of soap making but you can just as easily make it using the traditional Cold Process method or the Hot Process method. 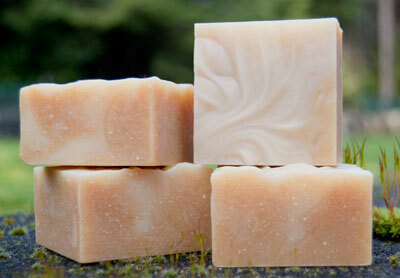 Begin by preparing your soap mould and measuring out your scent, silk, pumpkin and Kaolin clay. Make sure the scent and pumpkin puree (if using) are at room temperature and not chilled. Once that is done, start weighing out your hard oils and place them into your soap making bowl. It is a good idea to chop the hard oils up a bit to make it easier for them to melt quickly. Next weigh out the liquid oils and set them aside. Weigh out your water and then your lye. Slowly pour the lye beads/flakes into the water and give it a gentle stir. Add in the silk peptide and continue stirring gently. Once the lye beads/flakes have dissolved, you can pour the lye solution over the hard oils. Gently stir the oil/lye mixture around using your whisk to carefully mash down the chunks of hard oil. As soon as the hard oils have completely melted you can add in the soft oils and Kaolin clay. If you like you can add in the pumpkin powder or puree at this time as well. I kept my powder out so I could add a white top to the soap bars. Using your stick blender, give the soap batter 3 - 5 second blasts with the blender followed by gently stirring. Keep alternating until the soap reaches a thin trace and everything is nicely blended. You can then add in your scent blend and stir to fully combine. If you would like to add a white top to your shampoo bars, pour off a small portion of the base and add the pumpkin powder or puree to the larger portion. Blend it in well and then pour it into your soap mould. Top with the white soap by drizzling it or simply pouring it over top. I found the soap batter set up quite quickly after the scent was added so you may not have a lot of time to play around with a design. Insulate the soap in your usual manner and cut it once it has cooled and is hard enough to handle, usually a couple of days. Leave the soap to cure for 4 weeks and then...go wash your hair!